Chhiah-tō Guinea Kiōng-hô-kok tiàm-tī tiong Hui-chiu sai-hōaⁿ, Guinea-oan hit-tah-á. Keh-piah ū Cameroon (pak), Gabon (tang, lâm), kap São Tomé kap Príncipe (sai-lâm) chit 3 kok. Léng-thó· pau-koah chi̍t-kóa-á hái-tó, kî-tiong siāng tōa ê 1-ê sī Bioko-tó. Siú-to· siat tī hia. ↑ PRNewsWire. 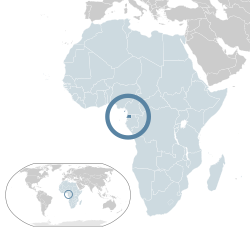 "Equatorial Guinea Adds Portuguese as the Country's Third Official Language". 18 July 2015 khòaⁿ--ê. ↑ 6.0 6.1 6.2 6.3 "World Economic Outlook Database, April 2016". IMF. Chit ia̍h siāng bóe tī 2017-nî 12-goe̍h 3-ji̍t (Lé-pài), 08:00 ū pian-chi̍p--koè.